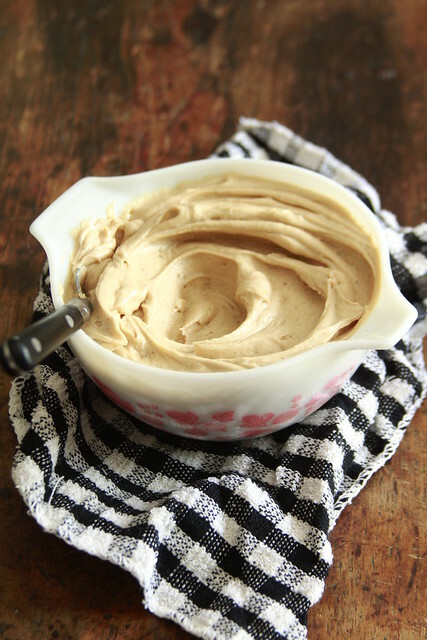 To me, caramel frosting is a perfect balance of salty and sweet. 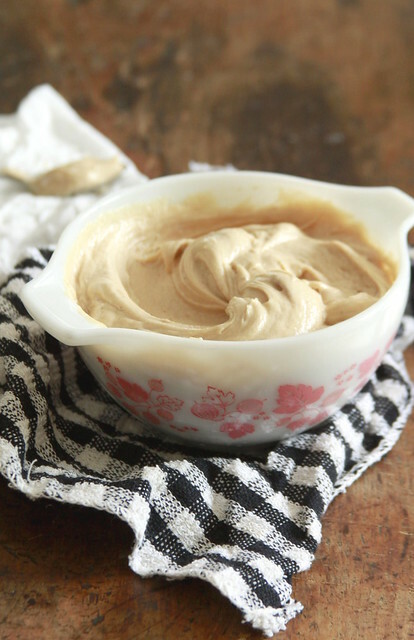 Make a buttercream, add caramel sauce and it should come out great, right? Not so. Most caramel frostings have two major problems: too sweet or it hardens to a candy like texture. Since caramel is, essentially, a sugar sauce, adding it to powdered sugar will make any frosting sweeter, hence the higher fat content. In order to resolve and update caramel frosting I needed to counter the sweetness to an already sweet buttercream. Here, in the Smooth Soft Caramel Buttercream I browned butter and then made the caramel in the same pot. It almost followed the steps of building a stew or soup, where flavors develop in several steps. Here the browned butter bits gets integrated into the caramel. These browned bits provide a nuanced and complexity that, alongside salt, downplays the sugar. Here I used dark brown sugar that, like the brown butter, contrasts the sweetness. To prevent the caramel sauce from solidifying, adding a teaspoon of neutral plant oil not only provides a smoothness but also prevents the end resulting frosting from becoming a poured icing that hardens like candy. Also don’t try to make the caramel sauce ahead of time or it will crystallize and create a grainy texture in the frosting. Finishing the Smooth Soft Caramel Frosting with a bit of regular softened butter gives the frosting smoothness and structure. 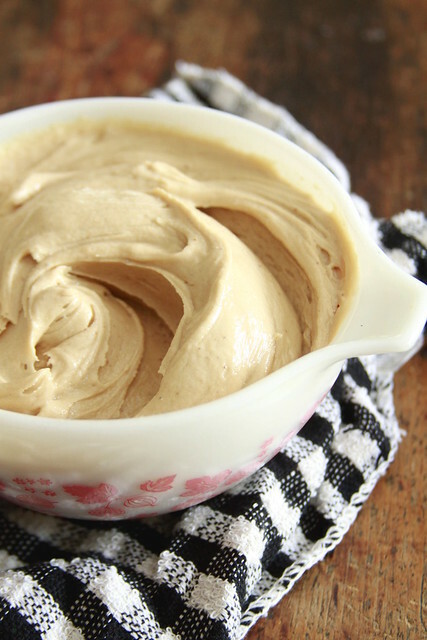 So use this Smooth Soft Caramel Buttercream for cakes, cupcakes, bars, and brownies. In a small heavy-bottomed saucepan, melt butter on low heat. Use a heat proof spatula to scrape the sides and bottom down. Let it slowly brown until solids dissipates and a nutty warm aroma occurs, about 4 to 6 minutes. Pour into a heat-proof bowl and set in the refrigerator while you make the caramel. In the same small heavy-bottomed sauce pan set over medium heat, melt butter, scraping up the browned bits from the previous butter. Add sugar, 2 tablespoons heavy cream, and salt, whisk until sugar dissolves. Let mixture bubble for 2 minutes, whisking every 30 seconds. Pour into a heat-proof bowl, stir in oil and vanilla. Let rest for 30 minutes. Beat brown butter and powdered sugar on medium speed until smooth and lump free, about 3 minutes, scraping bowl and paddle as needed. Add heavy cream, salt, and vanilla. 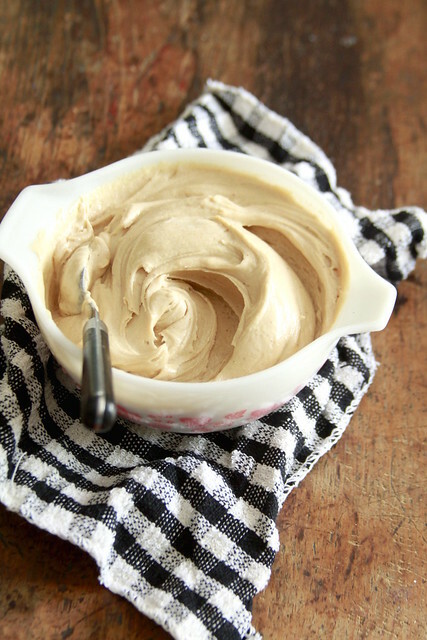 Whisk caramel sauce before adding it gradually to the frosting, beat to just combine. If it looks a little loose you can add the remaining ½ of powdered sugar, but it will firm up in the refrigerator.